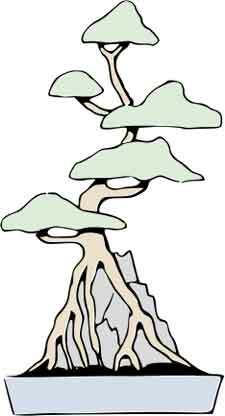 The upper roots of the tree grip the rock tightly and are exposed by erosion over a period of years, so that they end up growing above soil level. Trees selected for this style should first be encouraged to grow long roots by planting in deep containers. When the roots have attained sufficient length and a suitable, interesting rock has been obtained, all soil is washed from them. The exposed roots are then tightly tied to the rock with soft string or raffia, following the grooves and contours where possible. At this stage the tree is then planted in either a container large enough to accommodate the rock and allow the tree space to grow, or directly into the ground. An alternative method uses several young saplings, each forming an individual root with the trunks bound tightly together above the rock, to form one tree. Trident maples are very suitable and most commonly used for this style, with the bonsai usually displayed in shallow oval or rectangular pots.